The Phillies’ participants in the Arizona Fall League were announced Thursday. Five players were selected from Reading – RHP Tyler Viza, RHP Luke Leftwich, RHP Seth McGarry, 1B Darick Hall, and RF Austin Listi; and three players from Clearwater – RHP Sixto Sanchez, SS Arquimedes Gamboa, and 3B Luke Williams. Threshers win! Threshers win! Threshers win! 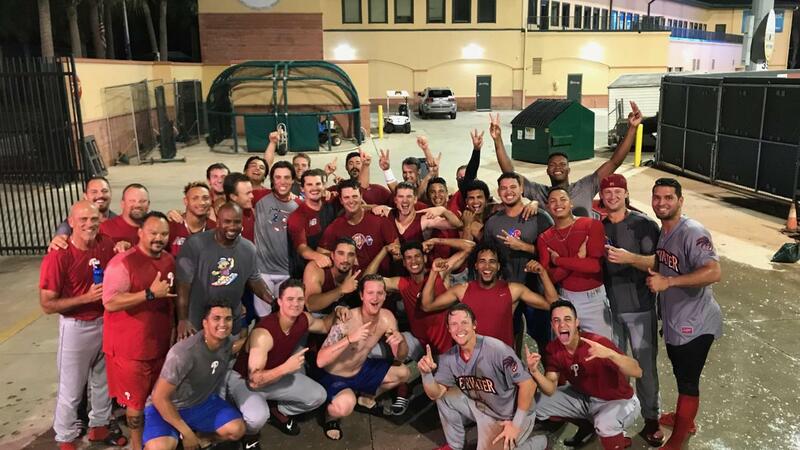 The Clearwater Threshers (74-58) beat Jupiter, 11-3 and lowered their “magic number” to clinch the division to two games. David Parkinson (3-0, 1.24) pitched six, four-hit innings allowing one run and striking out nine. (Game score, 72) Jonathan Hennigan was tapped for two unearned runs in his one inning. J.D. Hammer walked two and struck out two in his one inning. Addison walked one and struck out two in his one inning. Dan Connolly of the Athletic tweeted that the Phillies traded Jack Zoellner to the Baltimore Orioles this afternoon for International bonus pool space. Later this evening, he tweeted that the amount the Phillies will receive is $750K. Not a bad return for a 2017, ninth round pick who signed for $10K. The senior out of New Mexico saw limited action in 2017. He was initially assigned to Lakewood but went on the DL the next day. When he returned to action, he played 11 games for the GCL Phillies. He was assigned to the GCL Phillies East squad this season and finished tied for third in the league with 7 HRs. His 32 walks were tops in the league. His 42 strikeouts in 195 plate appearances gave him a 21.5 K%.